Sliding gates protect the items of most value, but are the least protected. Why? Some things seem normal just out of habit, but if you stop to think for a moment they don’t make sense. 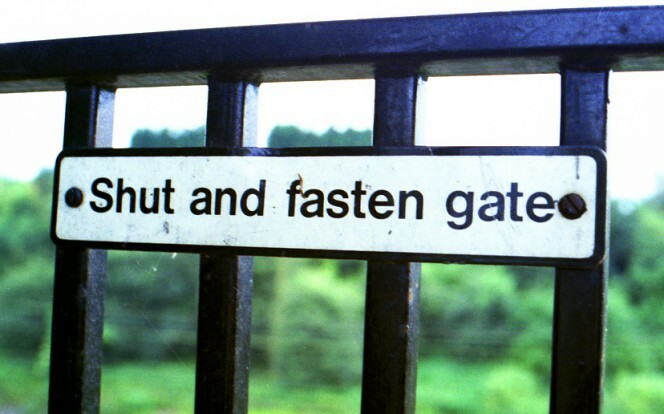 One of these is the fact that automated sliding gates are not closed with any type of automatic lock. Some are closed by manual locks or padlocks, thus defeating the convenience of automation. Sliding gates are often closed by a padlock, but in this way one loses the convenience of automatic opening/closing (photo by tOrange.biz ). But the majority rely solely on the strength of the automatic mechanism motor. 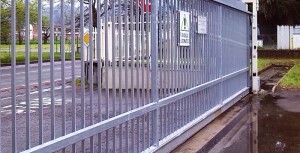 The majority of automatic gates are closed only by the motor. 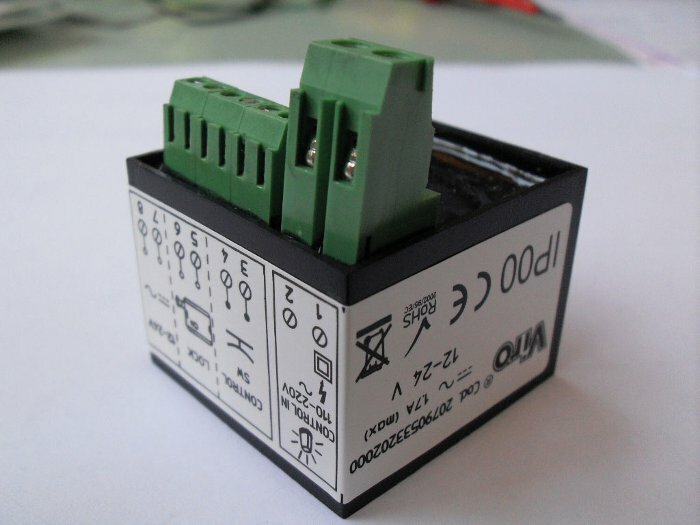 The problem is that all the motors, by law, must be easily switched off, to enable exit through the gate in the case of a fault of the automatic mechanism or a power failure. In these cases, it MUST be possible to open the gate. For this reason, all the motors of the automatic mechanisms have a disengagement device controlled by a small lock (such as those of letter boxes or even made of plastic) which a thief can break effortlessly in just a few seconds and then easily open the gate. “] By law, it must be easy to switch off the motors of automatic gates, to ensure the opening also in the case of faults or power failures, and for this reason they cannot be used to securely close the gate. This situation is all the more paradoxical if we consider that sliding gates are often used to close the entrances to places like warehouses, depots and parking lots, which house attractive items for thieves, such as goods and vehicles. It is for this very reason that sliding gates should offer greater guarantees that they cannot be easily opened, compared for example with pedestrian courtyard entrance gates (which are almost all equipped with special electric locks). Even though they often have a height which can be easily climbed over, it is vital that they cannot be easily opened, in order to prevent the transit of vehicles. 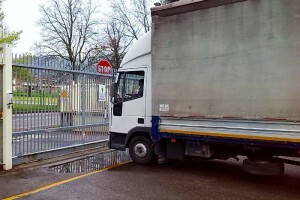 In this way, even if one manages to enter on foot, it will not be possible to either drive out any vehicles parked inside or enter with vans or trucks to load the items and goods stored inside the area closed by the gate. 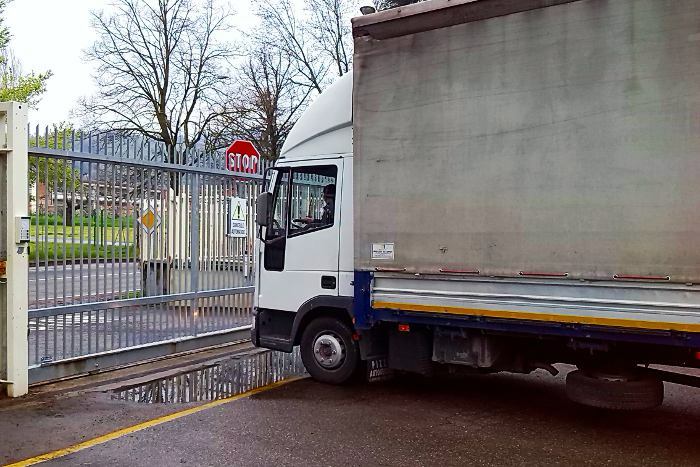 In warehouses, garages, car parks, factories and similar places it is very important that the gate cannot be opened, to prevent vehicles parked inside from being driven out or entering with trucks and vans to steal the goods stored inside. 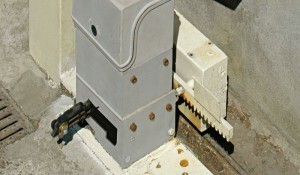 Sliding gates should therefore always be closed with a lock, as well as by the motor block. And this lock must be controlled by the automatic mechanism, without the need to open it and close it by hand. This is for a question of both convenience and security, because a lock which opens and closes by hand can always be left open by mistake. 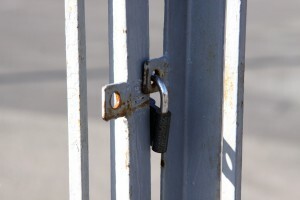 But common electric locks cannot be used on sliding gates, as they only work on swing doors and gates. 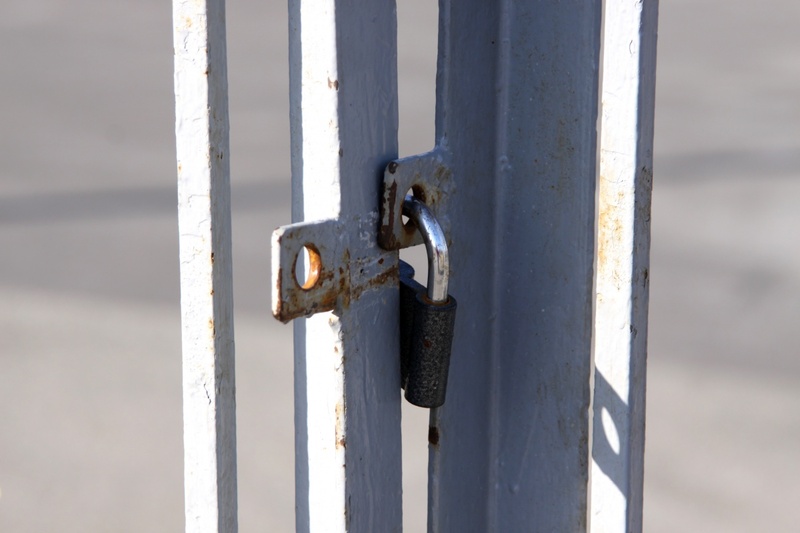 An electric lock is needed which is specifically designed to take into account, as well as the operating principle, the fact that sliding gates are generally rather long, and thus subject to considerable thermal expansion due to temperature variations throughout the year. Sliding gates are generally long enough to suffer from seasonal thermal expansions, therefore making the use of traditional shackle locks problematic. Yet a lock of this type did not previously exist. 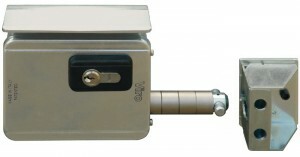 The first electric lock specifically designed, patented and manufactured for sliding gates is the “Viro V09”. The closure is not performed by means of a latch, as is the case for locks for swinging doors and gates, but by a rotating spike which, engaging in a special striker plate, secures the gate. Viro V09 lock is the first electric lock specifically designed for sliding gates. The spike runs in steel guides, so as to withstand impacts, and it is protected against possible attempts to cut it by means of rotating rings made of case-hardened and galvanized steel. Upon contact with a knife or cutting disc, the rings rotate together with the blade or disc, thus preventing it from gripping the metal and cutting it. The coupling system between the spike and the striker plate is able to tolerate variations in the length of the gate due to temperature changes of up to approximately 1 cm in one direction or the other (corresponding to a temperature range of 100°C for an 8 metre long gate), and withstand the inevitable lateral and vertical movements of the gate during opening and closing. 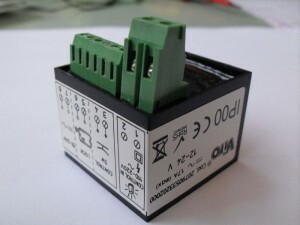 The lock is supplied as standard with an electronic card which allows it to be connected to any automatic mechanism. Viro V09 lock is supplied as standard with an electronic control unit which allows it to be connected to any automatic mechanism, making use of the flashing signal. The timing of opening and closing of the lock is controlled by the signal which activates the flashing light (which is fitted to all automatic mechanisms as it is required by law). To ensure full compatibility with any type of automatic mechanism the lock works both at 12 Volts and 24 Volts, either in AC or DC. 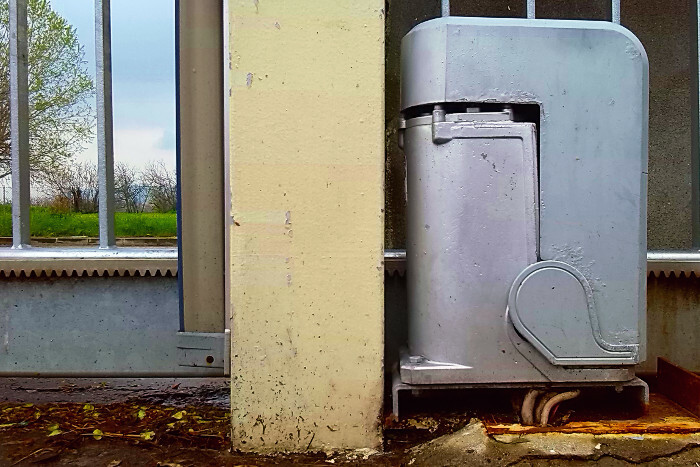 The versatility of the “Viro V09” is complemented by a wide range of accessories which allow all the possible types of installation systems, as well as the standard one on the upright of the gate to prevent it falling over (which is also always present as it is required by law). 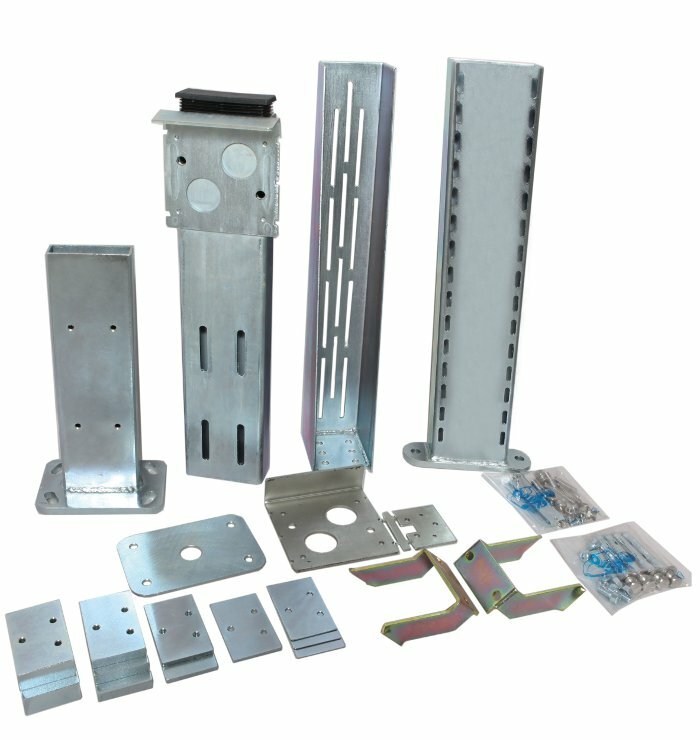 A kit is available which allows the Viro V09 lock to be installed in positions other than the standard one, planned on the upright of the sliding gate to prevent it falling over. The “Viro V09” is manufactured in order to withstand the harshest weather conditions. The case, cover and striker plate are made of galvanized steel. The springs which push the spike are made of stainless steel, and the cut-resistant rotating rings which protect the spike and all the moving parts inside the mechanism are treated with a special chemical nickel plating process (Niploy) which makes them particularly resistant to corrosion due to weathering. Lastly, it is supplied as standard with a galvanized steel cover, which is also useful as a fixing plate that can be welded directly to the upright of the gate which prevents it falling over. The lock can be controlled not only electrically but also manually using any type of European profile double cylinder or half cylinder, and for this reason it can also be installed on manual sliding gates. Compared to the shackle type locks normally used on manual sliding gates the advantages are twofold. On the one hand it provides the added security offered by the larger dead-bolt and on the other hand the reliability guaranteed by the fact that it is not affected by the thermal expansion of the gate, which are the leading causes of blockages of shackle type locks. Compared with closure with a padlock or a padlock and chain, which are other methods often used to close sliding gates, “Viro V09” offers a greater ease of use and greater security. It is easier to use because the lock can be opened and closed with a simple movement, whilst a padlock or, worse still, a padlock and chain must, each time, be opened, removed and stored, and then retaken, re-positioned and re-closed. There is greater security because “Viro V09” cannot be cut with a large cutter, as is often the case with normal chains. “Viro V09” is supplied as standard with a Viro 700 series half cylinder, but it is of course possible to install other cylinders, for example with the same lock keys already in use. So, from today, it is possible to close sliding gates in an easy and secure manner, just use V09. This entry was posted in Electric locks and tagged electric lock, gate on 31 March 2014 by Mara Rossi. I had no idea that it took a specific type of electric lock for a sliding gate vs. a swinging gate. My uncle owns his own business and has a lot with a swinging gate where he keeps his company vehicles. He has been thinking about upgrading to an automatic sliding gate, but I don’t think he was planning on using a lock since the door will open automatically. I will recommend that he visit your site. I like that you mentioned the main function of sliding gates, to keep out vehicles. It is a great way to deter burglars but also to keep out unwanted vehicles. Our neighborhood could really use this as we get plenty of solicitors.